SCVHistory.com | History of the Santa Clarita Valley by Jerry Reynolds | 51: The Settlers. When the Southern Pacific established its depot at Castaic Junction in 1887, residents north of the Santa Clara River could easily be tallied on one's fingers and toes. Among them were the families Lopez, Cordova, Jenkins and Bella, some of whom have already been noted (see Chapters 30 and 41). Foremost among the rugged, independent settlers of the region was George Washington Lechler, who built a small adobe home deep in Hasley Canyon as headquarters for his ranch in 1879. Lechler was one of the '49ers who found farming in Los Angeles more profitable than digging for gold. He married Abigail J. Hazzard — whose brother was mayor of Los Angeles — and the couple started a sort of dynasty that still runs cattle over the crest of the hills between modern Val Verde and Lake Piru. Then there was big, raw-boned William C. Chormicle, described as always being full of "peppery antics." He wore two six-guns and usually carried a rifle in case any argument started at long range. John Batist Daries settled below the Cordova spread about the time the Southern Pacific station was built, while William Blackburn Rose drifted down from the San Joaquin in 1886 to homestead in Charley Canyon. The arroyo was actually named for Charley Moore, a latecomer. The Tapia family came from Mexico in 1820, landing first in Monterey. They later moved to Los Angeles, where Jesus Tapia was born in 1861. Twenty-seven years later Jesus settled into the canyon named, of all things, Tapia. 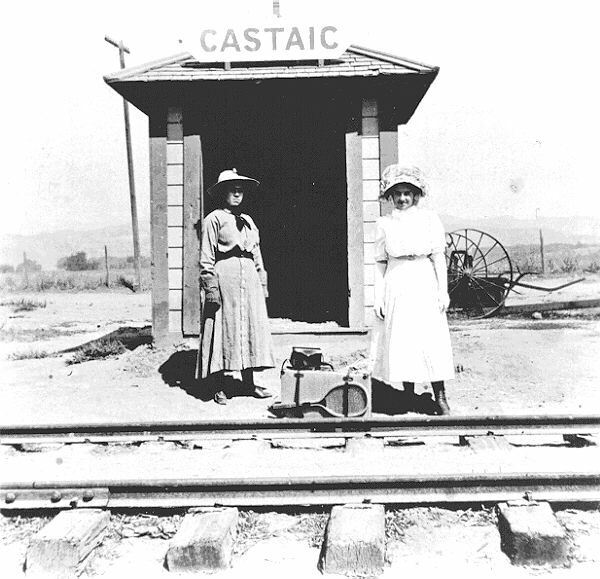 Because of all this immigration, a post office was set up at Castaic Junction on September 15, 1894, but it was discontinued the following August. A Castaic resident going down to Newhall would gather up all of the mail for everyone in the area and take it home with him. Somehow or another the ranchers, farmers and bee-keepers knew who had been to town last and would drop by to sort through the pile that was usually heaped up in a barn or some other out-building. The residents did get together, in spite of feuds and range wars that were popular at the time, to organize the Castaic School District on March 25, 1889. Another learning establishment known as Live Oaks appeared in Hasley Canyon during 1915, but it was combined with Castaic in 1929. Ever since the days of Phineas Banning, General Beale and the Butterfield Overland Stage, vehicles — at first horse-drawn, later motorized — made their way out of Los Angeles, through San Francisquito Canyon, up Grapevine Pass and then on to Bakersfield. When the California Highway Commission formed in 1911, one of its first priorities was to build a more direct road through the La Liebre Mountains. That task fell on a man with the unlikely name of W. Lewis Clark. Frustrated in several attempts to locate an easy way across the stony barrier, Clark finally blazed a trail right over the top from the mouth of Castaic Canyon to Gorman. It was called the Ridge Route. After a year's toil, during which four-horse Fresno scrapers graded hilltops alongside chugging Caterpillar tractors — and at a staggering cost of a half-million dollars — the Tejon Route, as it was originally dubbed, opened to the motoring public late in November, 1915. The Automobile Club did a little calculating and found that in the thirty-six miles between Castaic and Gorman there were 642 curves that added up to ninety-seven complete circles. It did cut sixty miles off the original road, however. Even before construction started in 1914, an enterprising businessman named Sam Parson purchased an acre of land from W.H. Cook that fronted the stake line, then threw up a general store that catered to the needs of the workers. Afterwards, "Sam's Place" became a mecca for truckers and the beginning of a new town called Castaic.